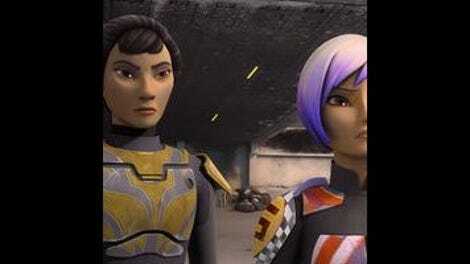 The crew is led by Sabine’s brother, Tristen, to Sabine’s mother, Ursa. Immediately the tension between Sabine and Ursa is palpable. Ursa orders her men to take her to prison! If Sabine didn’t wield the Darksaber, we’d have a totally different episode. Instead, the two hash it out within the throne room, then outside on a balcony. It’s a lot of exposition–and I mean, a lot–and while most of it is informative and dramatic enough for it to work, writer Christopher Yost gets caught up in the wordy messiness of it all (it doesn’t help that director Mel Zwyer mostly frames this in generic shot/reverse shots and gradual close-ups). There’s really two important aspects to derive from the dialogue. The first is that relationship between the Empire, Mandalorians, and the Wren family is a lot more complex than Sabine thought. Sabine’s weapon indeed forced Mandalore to bow down to the Empire, but Ursa’s commitment is based on fear of retaliation, not loyalty. She was happy that Sabine ran away; at least she was safe. (Unlike Sabine’s father, who is apparently held prisoner on Mandalore as more leverage for Ursa to keep Mandalorians in check.) But it’s clear that Ursa’s hold on her people is waning, and the “Wren” family name is in tatters–no Darksaber, no matter how symbolic, is going to be able to fix that. The second thing is the conviction that the actors deliver their lines, despite their wordiness. The “leader” hostility Ursa displays in the throne room contrasts nicely with the ”motherly” honesty she displays on the balcony, and actor Sharmila Devar balances both sides with appropriate conviction. So it makes it heartbreaking–if predictable–when she contacts Gar Saxon and tells him about their arrival. Sure, she thinks he’ll take the Jedi and spare Sabine (and ultimately leave Mandalore alone), but we know he’s untrustworthy. Thus, the inevitable betrayal occurs, but it leads to a badass action sequence, filled with shootouts, jet-packs galore, and a Darksaber/lightsaber battle that feels like a boss fight in a video game. This time, Sabine wields the lightsaber, and Saxon wields the Darksaber. If Zwyer seemed bored directing the dialogue scenes, he makes up for it with the action (although, to nit-pick, the blocking of the shootout is kind of sloppy–I’m pretty sure Ursa shoots towards her own men and not where the bad guys are). The Sabine/Saxon fight is the highlight of the episode; if there’s one thing this season improved on, it’s definitely the action. It’s arguable that there’s some symbolism in Sabine using an lightsaber against her Darksaber-wielding nemesis–remember, she never wanted it in the first place. 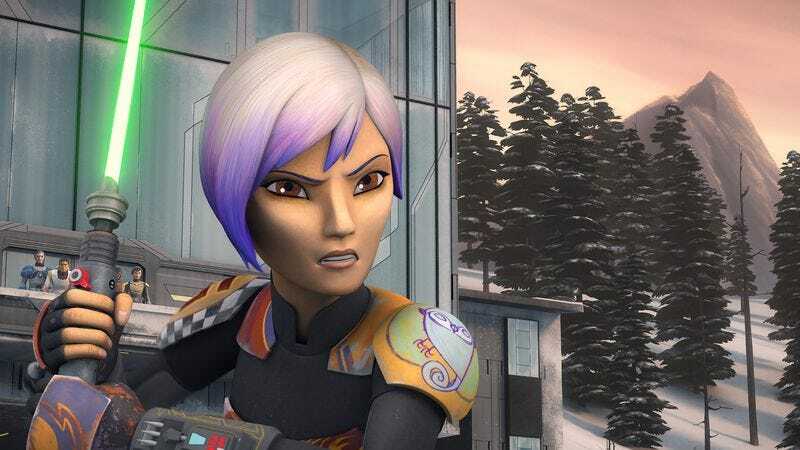 In fact, she commits to finding the rightful leader of the Mandalorians (and save her father), but at a surprising cost: Sabine opts to stay behind on Kronos. It’s surprising in the sense that Star Wars Rebels would make such a bold decision. I’m sure that we’ll see Sabine again at some point, but I genuinely don’t know where the show will go now without the cast’s resident weapons’ expert. “Legacy Of Mandalore” may not be as poignant as “Trials Of The Darksaber,” but that’s due to the episode’s focus on brand new characters that had to stake an emotional claim in such a short amount of time (Ursa makes her presence known way better than Tristan). The episode commits to its story, even through the excessive dialogue, and ends on a couple of great scenes, leaving the future cloudy. It’s rare to be eager for the next episode, but I am. I had to chuckle at the design of Ursa’s… house? Mansion? 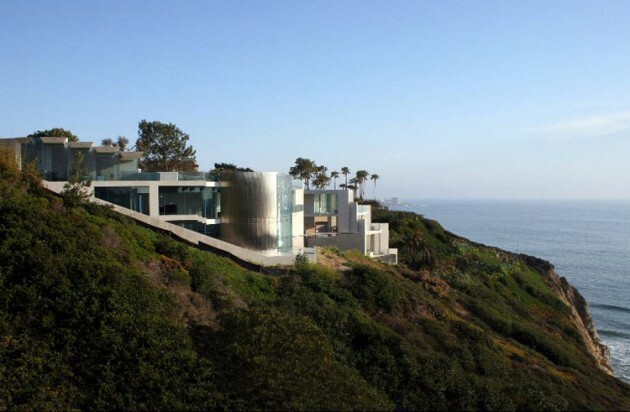 Why did it look like a McMansion on a California cliffside? I could see Tristan being kind of annoying, but I think he works. While he showed his loyalty towards his family in the end, I think wavered just enough to be a potential traitor later on. It wouldn’t be be a shocking development but it would add more conflict in the whole Wren family saga. The final fight scene, to me, makes up for the clunky dialogue. From the shot of Saxon slamming Sabine through the window, to the wild battle on cracking ice, it was pretty well shot all around. I really loved the part where Sabine used a flamethrower followed by sabotaging Saxon’s jet-pack–it gave off a very “figure out how to cripple the boss” vibe. I didn’t think Sabine was gonna be killed at the end, but that I even kind of thought she would be is a point in the show’s favor. Fenn Rau is in the episode too, sneaking around and helping out at the last minute. One of Star Wars Rebels’ biggest faults is using outlier characters to solve narrative problems around the edges. Just takes away from its main characters using their own ingenuity to get out of situations. I love how the show has no idea how to use Ezra now, who used to be the main character. He’s basically the comic relief here. The “he shot first” gag was pretty good, but it probably would have been more effective in another episode.